Kim Kardashian and Kanye West weren't the only stars to tie the knot this weekend. 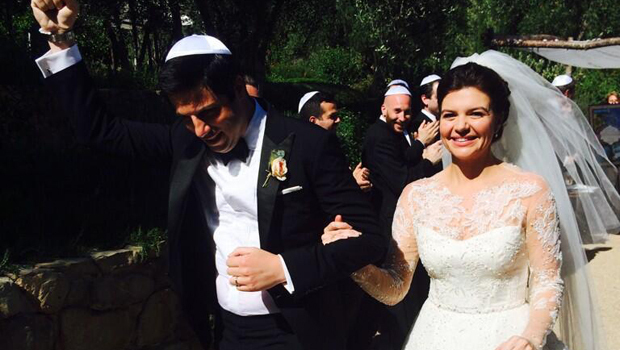 "Happy Endings" alumna Casey Wilson married the show's creator, David Caspe, on Sunday at the Ojai Valley Inn in Ojai, Calif.
"David and I couldn't have been more excited to celebrate our special day with all of our closest friends and family," Wilson said in a statement to Us Weekly. "Oprah, sadly, was a no show. (Probably because we've never met. Maybe next time?)." Comedian Whitney Cummings also snapped a photo of the couple on their big day and tweeted it with the caption, "Baby girl @casseyrosewilson is off tinder folks." Wilson, 33, who played Penny Hartz on the now-canceled "Happy Endings" and is a former cast member on "Saturday Night Live," wore a Monique Lhuillier gown with lace sleeves and Jimmy Choo shoes for the ceremony, Us Weekly reports. She and Caspe, 35, got engaged last year over Labor Day weekend. Wilson will appear next in the upcoming NBC comedy "Marry Me," premiering this fall.